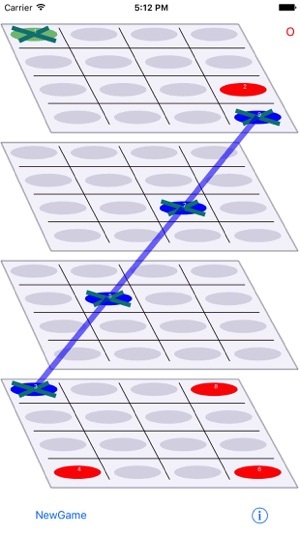 Play Tic-Tac-Toe, not for 3-in-a-row, but for 4-in-a-row inside a 3-dimensional playing field. Play against the computer, or a friend. There are 76 different ways to win in 3 dimensions, including 28 possible diagonals. Can you find all the ways to get 4 in a row and beat your opponent? XOCubed includes options for choosing one-player or two-player mode, playing first or second in one-player mode, and selecting one of 10 different difficulty levels. Minimal changes from the 2009 version. 1 minor bug fix. Updated for iOS 10 (and thus no longer compatible with the iPhone 3G, 3Gs, and 4). 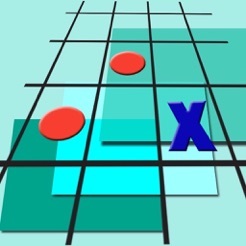 I was looking for an iPhone version of this 4x4x4 tic tac toe game but couldn't find it because of it's odd name. I used to play the 3D board game version called Qubix and I wrote my own version when computers still used punch cards. This version plays a hard game at level 10 which I can sometimes beat if I go first. I tied once and it didn't report that the game was over even though there were no moves left. Still it is free, fast, and challenging. The board layout alignment is off so it is hard to see diagonals, but that's part of the callenge. It would be nice if it kept win/loss statistics but maybe you don't want to remember how often it beats you. I looked into a bunch of 4x4x4 apps because it's hard to find other people to play. All of them weren't true 4x4x4 games. This one really delivered, and is well worth the couple bucks. Maybe the computer is a little too hard on lvl 2, or maybe I'm just a dunce :-) I definitely recommend this app! All I have to say is that it's free and better than the two dimensional 3 by 3 version.